As I mentioned in my last post, summer is a time I love to create new activities for my students! This is actually a project I made a few summers ago, but I realized I never blogged about it, so here you go! (I apologize in advance for the terrible photo; it was taken a long time ago, and the actual activity is packed away in my classroom, so I can't retake it right now). 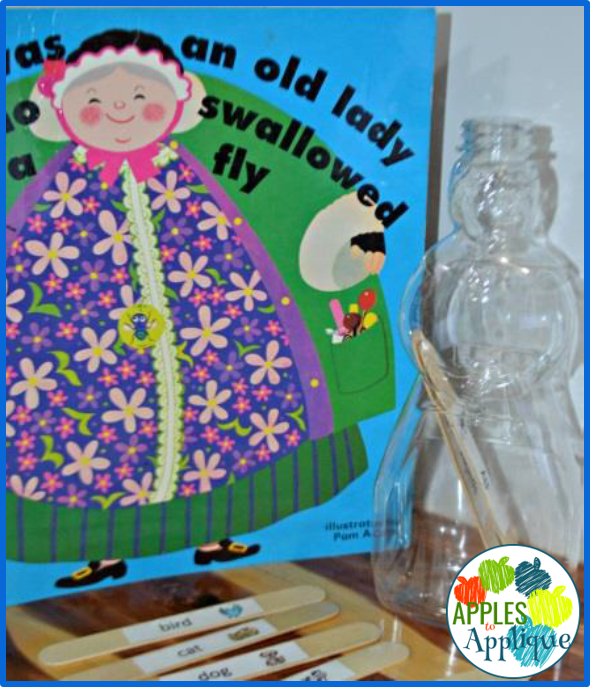 Apparently I am all about literacy activities involving old syrup bottles these days, haha! For this activity, I chose to use an old Mrs. Buttersworth brand bottle, since it's shaped like a woman. You could really use any type of canister or container that will fit tongue depressors. I've even included two labels for that purpose, one with the wording "Old Lady" and one with the wording "Old Woman" so that you can be consistent with whichever version of the story you have. The prep on this is pretty simple, and once it's done, you'll have this activity for years! Just print out the animal labels and glue or Mod Podge them to tongue depressors. Honestly what took me the longest was getting the label off the syrup bottle! I finally found an awesome tip about using peanut butter--sure enough, it took off all of the sticky residue! Of course, I then washed it VERY well to make sure there was no trace of peanut butter left, what with peanut allergies being common in the classroom. I'm pretty sure it was the oil in the peanut butter that broke down the adhesive, so if you're concerned about it, you might try another type of oil first. This book was my favorite version of this story when I was little. I was SO EXCITED to find it at a used book store several years ago. Of course, any version will work with this activity! 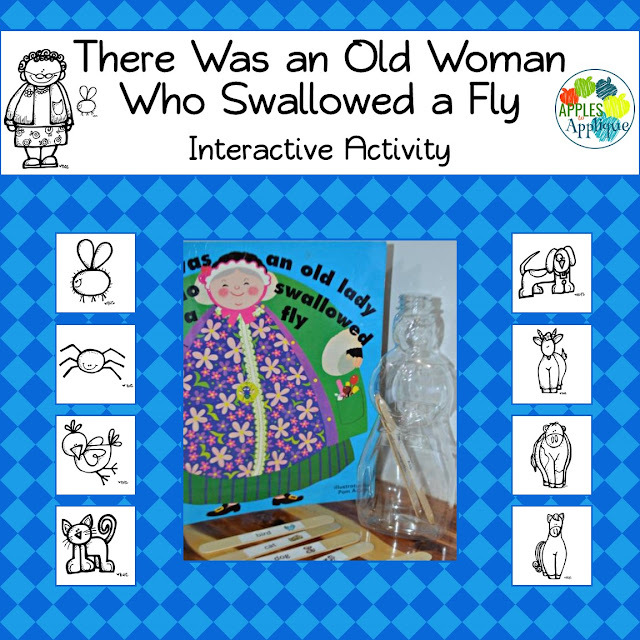 This activity can be used to keep students engaged during the actual reading, as they can come up to put their animal in the Old Lady canister as it occurs during the story. It can also be used as a retelling or sequencing small group, as the students can work on recalling the order after they hear the story. My students absolutely love both options, and get so excited when it is their turn for their animal! 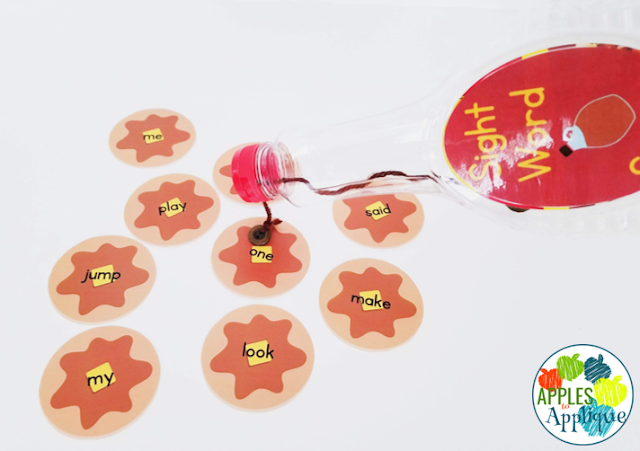 I like that this activity not only works on sequencing and retelling, but it is also easy to incorporate some letter recognition and beginning sound phonological awareness. "We need the bird. What sound do you hear at the beginning of b-b-bird? What letter makes that sound? Do you have that letter on your stick?" Of course, there are pictures to help scaffold the learning, too. Get this activity here, and I hope you continue to enjoy a productive yet restful summer! Summer! Such a wonderful time for us teachers to relax and refresh--and plan for the coming school year. I know I started making plans before the school year had even ended. The last month of so or school this year, I kept looking around my room, thinking about what worked well this year and what I would like to change, how I could rearrange things to make them more efficient, and what new ideas I would like to implement. Now that I have some "time off" (I say that loosely, because we all know summer is when teachers get planning and prep done for the next year), I am creating new things to add into my rotation of learning labs, literacy stations, and math stations. Today I've got two fun activities for you. The idea for these has been rolling around my brain for a while, but I just finally got them completed! They're essentially different versions of the same game, one for letters and one for sight words. 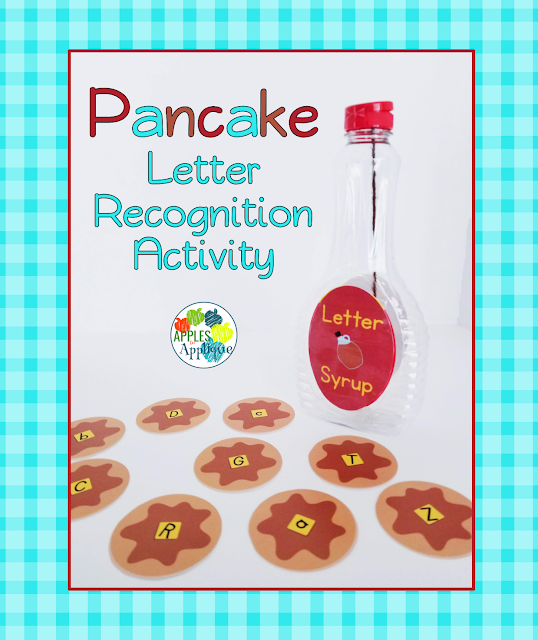 Get this fun letter recognition activity here! Get this fun sight word activity here! 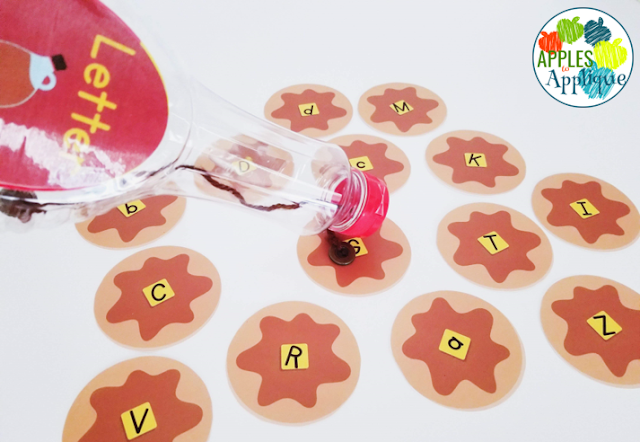 These games require a little one-time prep (cutting out all the pancakes and making the syrup bottle), but once that's done you'll have something fresh and new to add to your literacy stations. This is the perfect kind of activity to prepare during the summer; turn on your favorite show, kick up your feet, and relax with a drink while you cut out the pieces. -Student puts “syrup” on a letter and thinks of a word that begins with that letter. -Includes both Pre-K and Kindergarten sight words, for a total of 92 words. Mix and match to meet your students' needs. 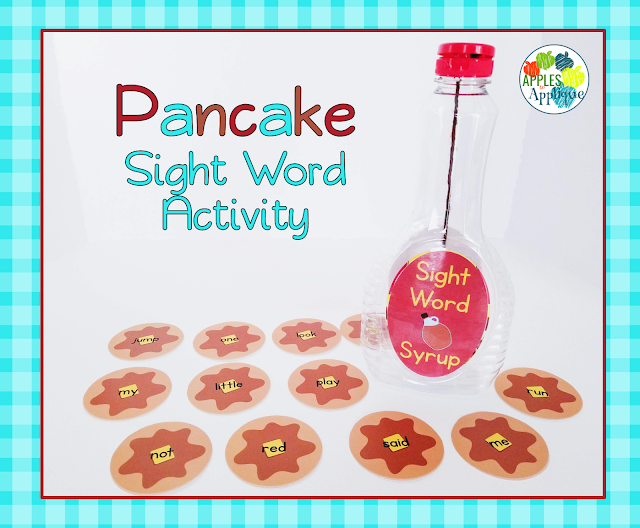 Easy and fun, and what kid doesn't love pancakes, or getting to play with a syrup bottle?! Speaking of that, to make the syrup bottle, I simply adhered the included label with packing tape. Then I threaded a short piece of brown yarn through the opening. (I tied a brown button on the end to both weight down the yarn and to keep it from slipping back through the opening). You could just as easily use an empty syrup bottle without the yarn, and just have students touch the top of the bottle to the pancakes. This activity could be used over and over throughout the school year, both as you are introducing new letters/words, and as a review activity. It will also make a handy tool to assess students' knowledge. I love activities that help me assess their knowledge, but don't feel like "testing". I hope you and your students enjoy these activities! Happy summer break!